Christine Reyes shares the first photo of her bundle of joy and her struggles during her pregnancy. 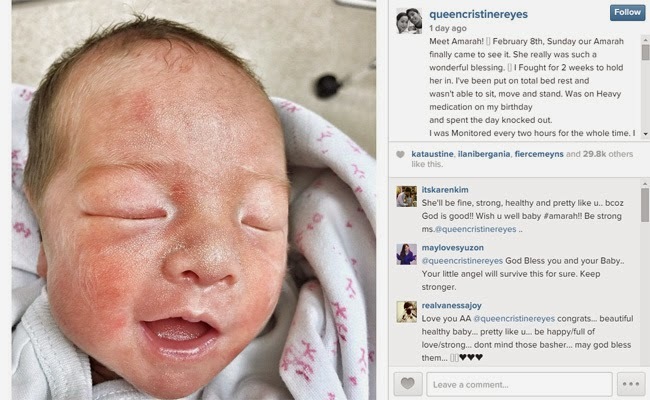 Reyes gave birth to Amarah on February 8, 2015 a few weeks shy from full term. Considering her baby as a wonderful blessing to her and her partner Ali Khatibi, Reyes shared her experience of struggle for two weeks to keep her baby in her womb. She was ordered to be in complete bed rest, unable to sit, stand nor move around to lessen the stress experienced by the baby. She had been on medication for a couple of days and was monitored extensively every two hours. She also shared that she had been in and out of the delivery room. After all the efforts, eventually, she was unable to delay giving birth anymore, her baby was born and she loved her instantly. Reyes also shared her pain as some people judged her that her premature labor had been her fault. Despite the negative comments, she is determined to focus on the positive things in her life and the hopes that her their baby will finally be healthy enough to be released from the Neonatal Intensive Care Unit. Reyes also posted that she did her best to have a full term pregnancy by asking advices from her family, friends and other professionals. She never attempted to hide her pregnancy. A few months ago she said that she did not reveal her pregnancy immediately because she wanted to first ensure the safety of her baby and herself. She had a sensitive first trimester and she had done her best to keep their baby healthy. Finally, she expressed how much she and her partner loved their child dearly and hopes to finally take their baby home with them.